Many of my friends and family have been demanding more house pictures, and they are coming, I promise. But in the meantime, here is a different view of my house. 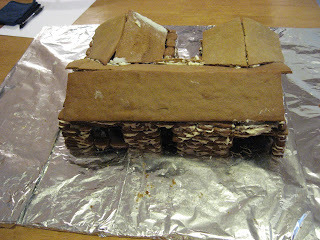 Yup, that's a scale (we think) model of my house made out of gingerbread. 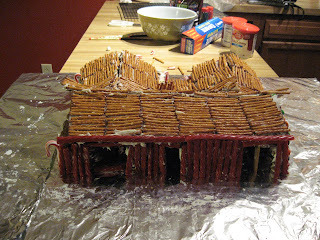 So my friend A, who likes to take on big projects, decided it would be fun to make a gingerbread house. Okay, so do thousands of families. 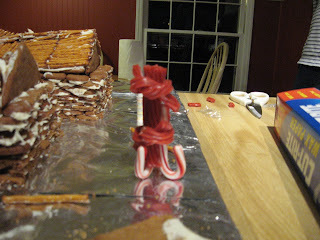 Then he decided that he should make my house out of gingerbread. Okay, a little ambitious, but a cool idea. 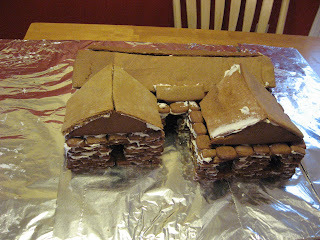 Then he decided that typical gingerbread sheets were not sufficient, and so he would make bricks out of gingerbread. I pointed out that my house is not brick. This did not seem to matter. The back roof is a big piece, and we needed some support. But A insisted the entire thing be edible. So he created a support out of the tools we had. And here are a few shots of it decorated. The decoration does not follow the actual look of the house. It was pretty much an all-day activity, but we had a good time. 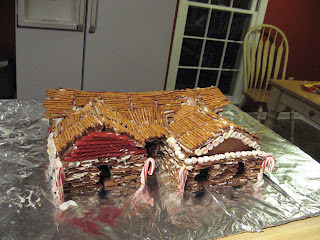 And how cool is it to have your house made out of gingerbread? !